Introducing the UHarvest Lite Scale System - Unverferth Mfg. Unverferth Manufacturing Co., Inc. announces the new UHarvest® Lite scale system for complete ISOBUS grain cart scale operation, or for adding to any brand of grain cart already equipped with scales. The UHarvest Lite system quickly and conveniently connects the grain-cart scale load cells using a reliable ISO cable into the tractor’s ISOBUS connection. Grain cart load weight is then easily viewed on the tractor’s virtual terminal in the cab, eliminating the added need for traditional scale displays. 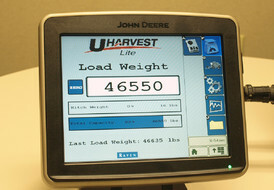 UHarvest Lite scale displays up to 400 unloading events that the user can reference on their VT display showing weight, date and time. Its “Combine Verify” feature allows quick and easy calibration of the combine’s yield monitor. The UHarvest Lite system provides the same accurate, infield-weighing capability as the full-featured UHarvest data management system. If detailed, downloadable data is desired at a future point, UHarvest lite can be updated to the full-featured UHarvest data management system by simply adding the appropriate cabling and a processor. UHarvest Lite will be available as a factory-installed accessory on the company’s Brent, Killbros, Parker and Unverferth grain cart lines and field-installed on any other brand of grain cart already equipped with scales. UHarvest Lite was developed in conjunction with Raven Industries and designed for reliable, long-term operation. Growers are encouraged to check with their nearest Unverferth dealer or visit uharvest.net for complete details. Unverferth Mfg. Co., Inc. is a family owned manufacturer and marketer of tillage, seed, hay- and grain-handling equipment along with liquid fertilizer applicators, pull-type sprayers and agricultural dual, triple and specialty wheel products. For additional information, contact Unverferth Manufacturing Co., Inc., P.O. Box 357, Kalida, OH 45853. Phone 419-532-3121 or visit the website at unverferth.com. About Raven Industries, Inc: Since 1956, Raven Industries has designed and manufactured high quality, high-value technical products. Raven is publicly traded on NASDAQ (RAVN) and has earned an international reputation for innovation, product quality, high performance, and unmatched service. Raven's purpose is to solve great challenges in areas of safety, feeding the world, energy independence, and resource preservation. To realize this purpose, we utilize our strengths in engineering, manufacturing, and technological innovation to serve the precision agriculture, high performance specialty films, aerospace, and electronic manufacturing services markets. Visit www.RavenInd.com for more information.